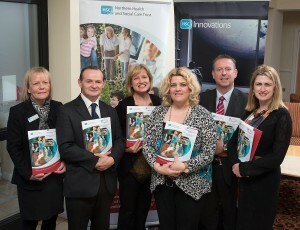 On 1st October 2014 HSC Innovations, in conjunction with the Northern Health and Social Care Trust (NHSCT), the Office for Research Ethics Committees Northern Ireland (ORECNI) and the HSC R&D Division, delivered a seminar on ‘Getting Started in Research’ for members of staff in the Northern Trust. Dr Des Rooney, Director for Research and Development, NHSCT welcomed the attendees and outlined the importance of research, development and innovation within the trust. The attendees represented a wide range of clinical areas and were able to learn about the research and development process, funding opportunities, ethics, and innovation support available to them for developing their idea/s to provide a solution to improve patient care. Dr Janice Bailie, Assistant Director, HSC R&D Division, outlined how to get started in research as well as describing the range of funding opportunities available to support R&D. Dr Siobhan McGrath, ORECNI, covered in detail the role of the ethics process, and Mary McDonald, R&D Manager, NHSCT, covered the practical step by step support and guidance available from the NHSCT R&D office – for developing your idea, in particular the support available from the pre-application stage, i.e. sponsorship, funding, design of the project protocol, submission of an application for research governance approval through to the stages of management of the project and final stage of project closure and dissemination of results. Dr Jackie Jamison, Consultant Biomedical Scientist, NHSCT, highlighted some molecular pathology research underway in the trust, as well as describing the importance of doing research for the following reasons: improves the department; improves service to users; good for future developments; improves staff skills set; and improves experience. Dr David Brownlee from HSC Innovations presented a detailed overview on how HSC Innovations provides support for developing ideas to improve patient care. This included the areas of what is intellectual property, the value of intellectual property that arises from research and clinical practice and the policy relating to it. He provided a number of examples where products have been developed as a result of ideas and solutions for a clinical need. Mary McDonald, Research Administrator; Dr Des Rooney, Director of Research and Developmet; Dr Siobhan McGrath, Head of ORECNI; Frances Johnston, R&D Manager; Dr David Brownlee, Innovation Advisor, HSC Innovations; and Dr Janice Bailie, Assistant Director, HSC R&D Division. practical examples and success stories. Dr Rooney said he hoped the seminar would encourage staff to become more involved in research and clinical trials and progress their innovative ideas which could be further developed for the benefit of patients, clients, and staff and overall improve the quality of service provided throughout the trust. Already as a result of the workshop there has been an increased number of enquires to HSC Innovations and to the trust R&D Office, which is very encouraging.